Chuck Wendig has opened the conversation about plotting and outlining, in time for NaNoWriMo (National Novel Writing Month). I have written about this before, because I have gone both ways with my writing--total pantsing (def: pantser: one who does things by the seat of the pants, i.e. without planning or forethought) as well as pre-plotting. How well each works may depend (for me) on the type of book. The Ninja Librarian didn't require a lot of planning, because each story stood alone, and was short enough to get it all out at once--and to edit easily. On the other hand, my first attempt at a full-length mystery novel was a disaster. It took well over a decade to draft, and was so riddled with plot holes and issues that I never was able to beat it into shape. The second went better, but still--revision for Death By Ice Cream was a painful and lengthy process that I didn't want to repeat. So when I decided to draft Death By Trombone (which is coming this fall!) during NaNo 2013, I made an outline. And by gum, it made the writing easier, and--the real key--it has made the editing easier (you wouldn't think so by how long that has taken, but, well, I got distracted by Halitor the Hero in the middle) (and I did a pretty danged cursory outline of that, which worked out okay, but it was a much simpler story). So my verdict has been: for easiest writing and editing, a bit of planning is in order. That leaves the huge question of what an outline might look like, and (more important) how you get there. Chuck describes several approaches to outlining in his post on the subject, and that's a good place to start. Go ahead and read it; I'll wait (caution: Chuck uses naughty language. Funny language, usually, but often naughty. Don't go there if you are easily offended). That's right. One page, and obvious questions. Who got killed? Why? Who killed him? What does my heroine have to do with it all? 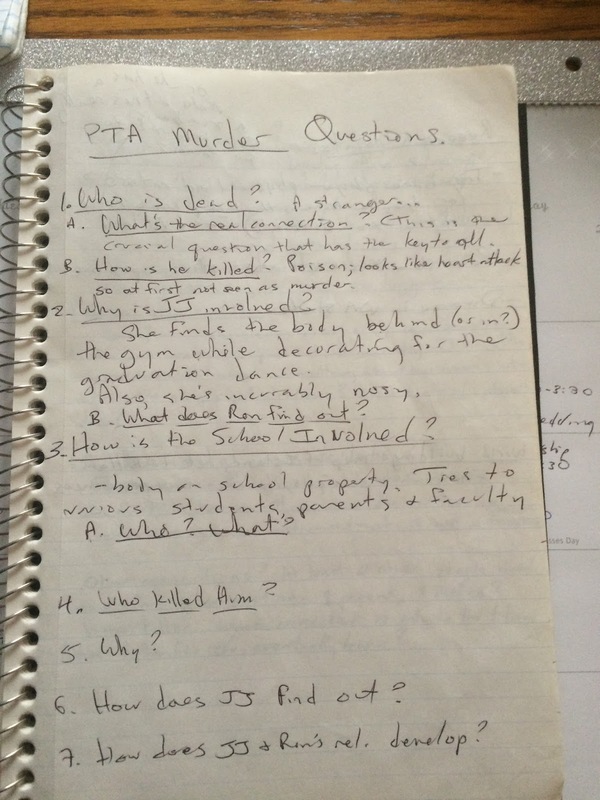 And, because these are, after all, the Pismawallops PTA mysteries, what does it have to do with the school/PTA? After this page, I spent a fair bit of brainstorming time (on the following pages) coming up with answers to many of these questions--and discovering many, many more questions to answer. Eventually, I did create a more traditional-looking outline, with 5 main sections for the main--not scenes, but arcs, I guess--of the story, and lists of the things that should be covered in each. This outline was what I referred to as I wrote, and I can't include it here because it would be a total spoiler. What did my outline do for me? First, it was a brainstorming tool. I could start small, with the obvious questions at the heart of any mystery, and use that framework to start fleshing out the story, start seeing the other questions. Eventually, I began asking really important questions, like "who are the red herrings?" "What is everyone lying about?" and also questions about the development of the relationships between characters. When the questions had bloomed out to be a pretty good look at the whole shape of the book, I knew several things: I knew what I needed to research (cause of death, divorce in Washington State, etc. 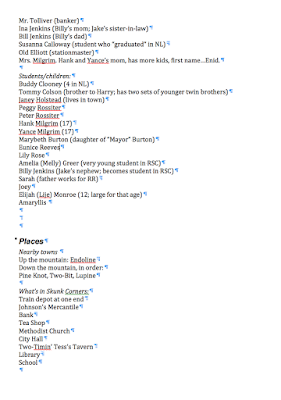 ), and I had a list of scenes and events that needed to go into the story, roughly in order. That was probably key for the fast-writing approach of NaNo. I could look at the outline every morning and see where I was and what I needed to do next. And if a particular scene was a problem, I could jump ahead, knowing where something (probably) fit into the big picture. 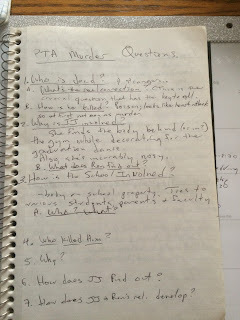 The final outline was fairly sparse, but I still had those pages and pages of brainstorming notes, too. That notebook stayed by my computer, so that I could consult it for all sorts of questions. In the end, the process worked: I drafted about 80,000 words in under 6 weeks, and the story held together as it was written the first time. One other tool that I am finding more and more important as I work through series: character charts. I use individual files on main characters, with everything I've learned about them. But I also have a quick-reference chart for Pismawallops Island, and another for Skunk Corners, listing every character I've put into the books, where they fit into the community, and anything really important about them. No more than one line per; if I need more, they get their own file. These files grow from book to book, though I'm wondering if I shouldn't maybe have saved separate versions for each book, so I could know at a glance when characters appeared. Maybe not. 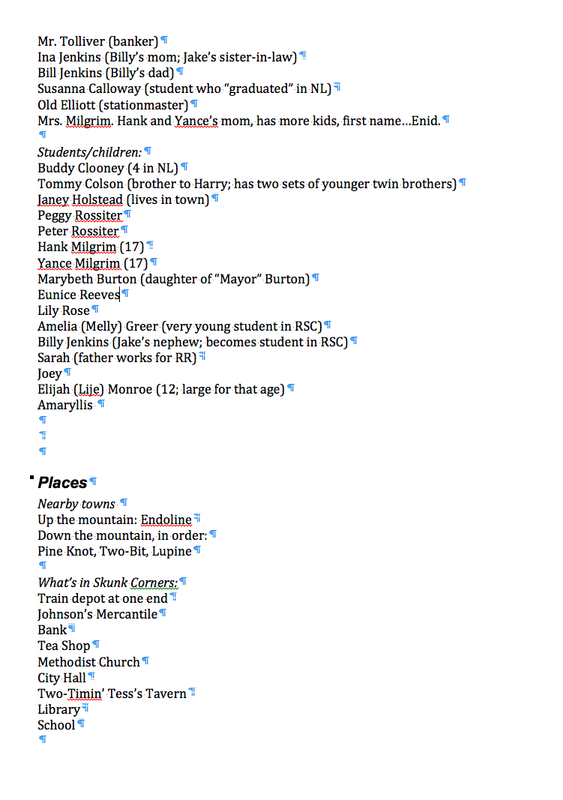 As you can see, in addition to people, I found it helpful to list all the places that I've brought up. What businesses and buildings are in town? What are the nearby towns? Geography is important, and I hate it when writers make mistakes or gratuitous changes in people or places from book to book. Growth and development of the community is natural, but if Endoline is up the mountain from Skunk Corners in Book I, it had better not be down the mountain in Book 3. In the end, that's what outlines and notes are all about: making the best book I can, with the fewest headaches. Every writer has to find her own way; these are the things that have helped me. Now to return to editing Death By Trombone, and outlining--brainstorming--the 3rd mystery. I make notes as I go, about other locations, drinks, hostelries, all the daily minutiae about the world(s) of the book. But there is a lot of thought about the characters before I start. Well, I can't start writing without knowing my characters, put it that way. We're pretty similar in our approaches, but you're probably more organised! I'd say it's more that I'm trying to learn to be more organized :) I had a good discussion of this yesterday with a couple of writer friends--we were talking about planning for NaNo, and the need to know the characters. One of us said that her approach, rather than outlining, was to write 1st-person character sketches and things so that she knows her characters thoroughly and can develop their distinctive voices. That sounded to me like an excellent thing to do! I will always want a better plan for a mystery, but for my other books, the general outline of things and knowing the characters seems as good or better. A couple of years back, Chuck gave a list of things to know about your character and I added a couple of more tips (including the secret that he will never tell). I'll see if I can find my master copy and send it to you. I think the one about the secret is a great one for knowing the insides of the character!